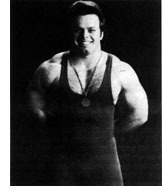 Mike Bridges, the diminutive Peoria East Bluff (White Grade School) native, and 1976 graduate of Woodruff, won his first World Title in Powerlifting at age 21, and his last World Title at 33. Mike began his Powerlifting career at age 15- as he could see no future in the usual sports menu at 4-foot-lO and 125 pounds. Encouragement to excell came early from Jim Morby, a teacher at White Grade School, who convinced him that a positive attitude, hard work, and belief in yourself could make anything possible. Training at Woodruff, he participated in the Spalding weightlifting program where he represented Woodruff. He won his first competitive event at the Mid-State-9 Weightlifting Tournament. His "just for fun with friends" powerlifting led finally to over 100 Worldwide wins, seven World Titles, and nine U.S. National Titles, setting 76 World records over a twelve-year period. Traveling with his U.S. teamates to over ten countries, including Germany, Finland, Sweden and India, the U.S. team never lost a championship with Bridges aboard. He competed in the 148, 165, 181 and 198 pound divisions winning World Titles in all four weight classes. He finally topped out at 5-foot-3 - pictured here at 181 pounds. A Tri-County Top Sports Figure in 1978, he has done color commentary for CBS and NBC for weight and power lifting, has traveled as a lifter coach, and has conducted numerous seminars in schools, gyms and training camps. 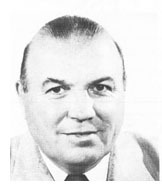 In 1982, he was one of the finalists for the prestigious James E. Sullivan Amateur Athletic Award. Now age 35 and 165 pounds, Mike would seriously consider training for the 1996 Olympics if Powerlifting is added as a sport and the site is Atlanta. A successful businessman, Mike now resides near Kickapoo while occasionally conducting seminars on power and weightlifting.